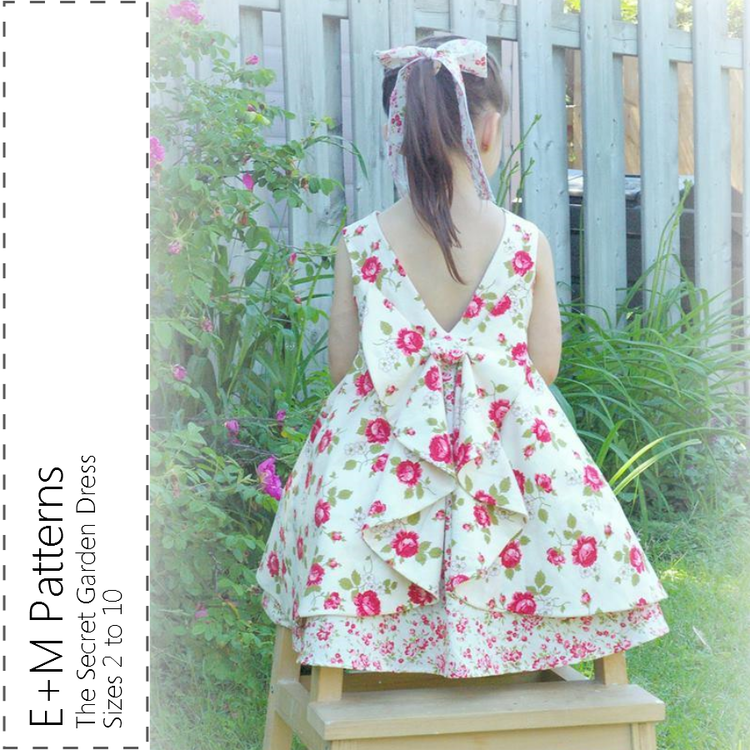 The Secret Garden Dress is pattern collaboration between E+M Patterns and Sprouting Jube Jube and the result is just lovely. 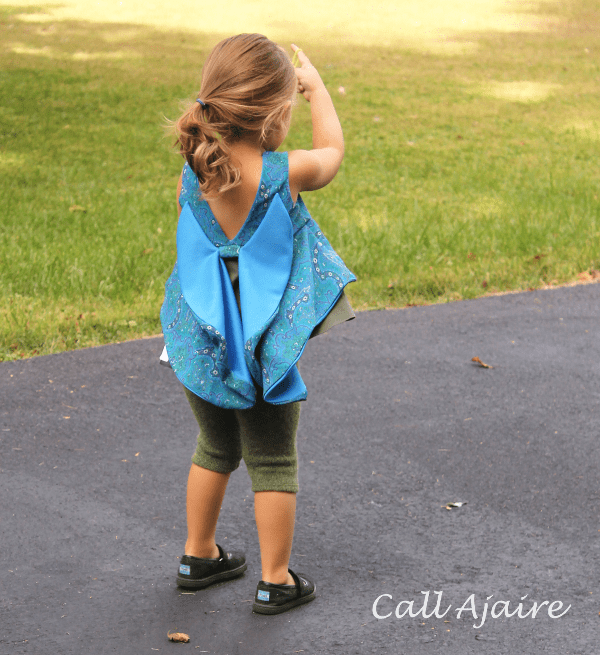 When I first saw it out in blogland I fell in love with the gorgeous back. The bow detail is so lovely, but the v-shape above it makes it all come together so perfectly. 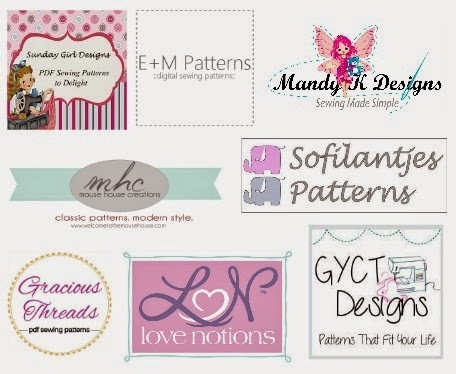 Today is my stop on the pattern tour and I’d love to show you what I did with the pattern. Since we have a couple of months before the holidays begin I didn’t want to make a holiday dress. Bean may have another growth spurt between now and then so I’ll probably wait until closer to December before sewing a nice Christmas dress. So I decided to crop the skirt and flounce and make it a top instead. 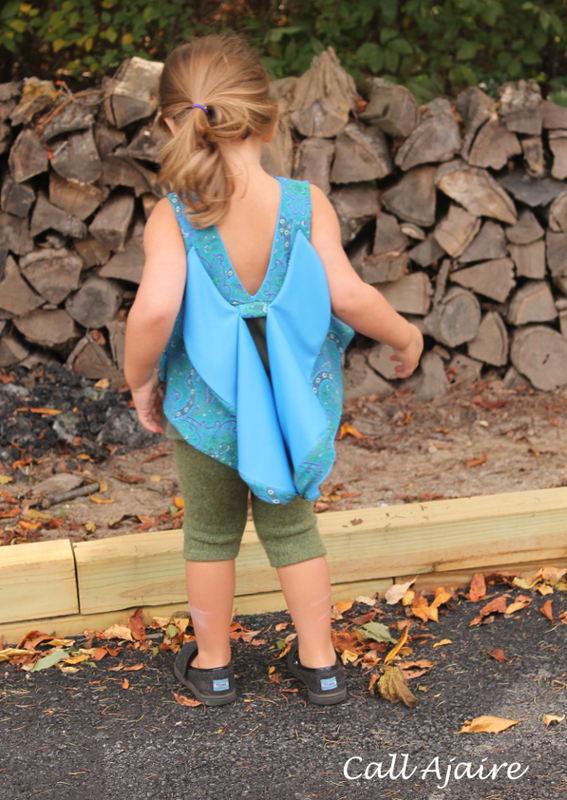 It’s still so lovely with the bow detail in back, but it’s a little less dressy so we can get lots of layering wear out of it this autumn. The pattern itself is a bit more involved than a beginner level, but not by much. If you go slowly and follow the instructions you should have a lovely dress with perfect details in no time. The sizing runs from 2 to 10 so think of all the summer parties, holidays, and just everyday wear you will get out of it. The twirl factor is high so any girl would be happy to wear it and spin. If you buy the Secret Garden Dress during the tour you can use the coupon code SGTOUR25 to get 25% off the pattern. You can also enter the great Rafflecopter giveaway below for a chance to win some great prizes from the sponsors. To turn the dress into a top I simply cropped most of the skirt pattern piece while maintaining the original curve of the hemline. 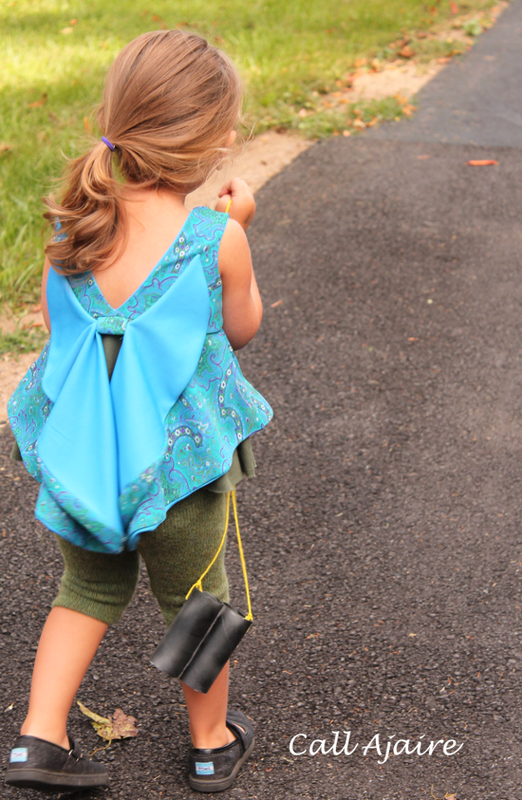 Then I cropped the flounce to be 1″ shorter than the skirt where they meet at the side seam (so they will meet properly later on in the pattern) and tapered it down toward the center back so there would still be lots of flouncy bow back there. 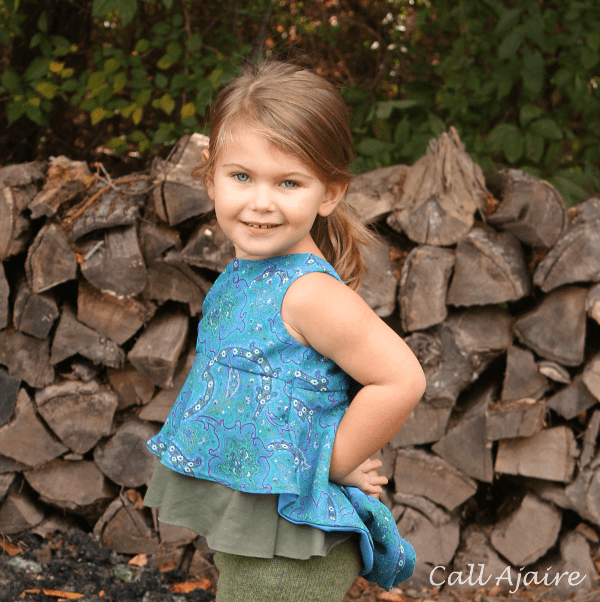 I wanted to incorporate reuse into this top since this is the Hand Me Down challenge week for Project Run & Play, so I grabbed these two old dresses that were in my reuse pile and chopped them down to make this fun look. 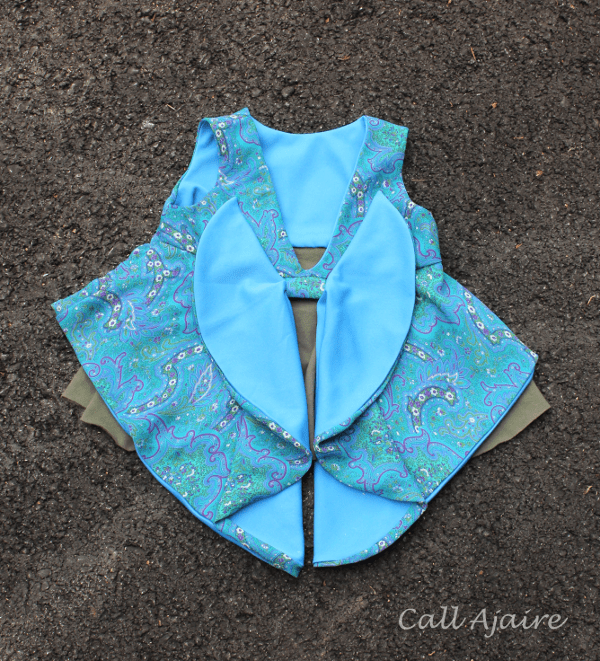 The underskirt of the top is the green knit and the bodice, linings, and flounce are the main and lining fabrics from the blue-green dress. This top would be super cute over a pair of jeans, but of course to make the look even more casual, I wanted Bean to be able to wear a pair of cropped leggings. If you follow along on Instagram, then you saw the stained old wool sweater that I used to cut out the leggings. The pattern is the free Leggin’s pattern by Love Notions that you can get here on Craftsy (*affiliate link). 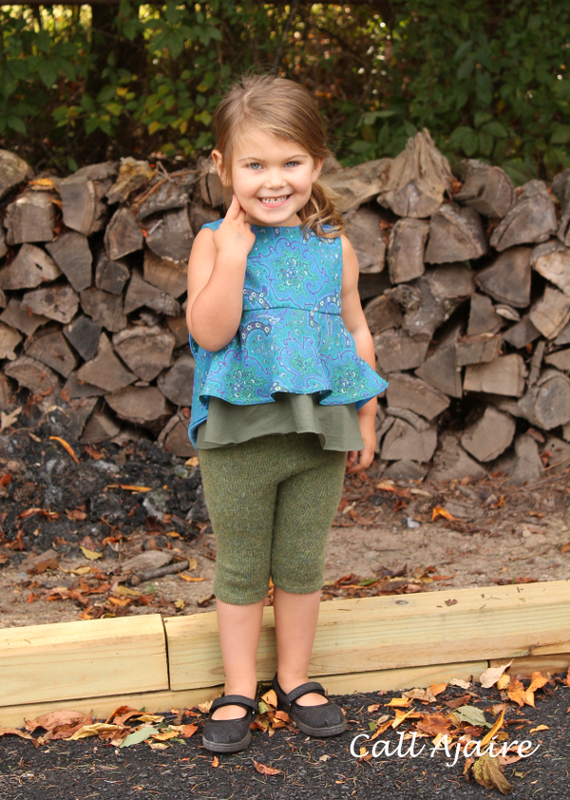 They pattern includes size 2T to 14 years and they’re basically the only leggings pattern you’ll need. I just cropped a bunch off the length off of the 3T and they were so comfy that Bean didn’t want to take them off. Be sure to follow the rest of the Secret Garden Tour. There have already been some dresses that have blown me away. Love this as a top! Great refashion all the way around. That blue is a great color on Bean! The top is absolutely gorgeous! I love the choice of fabrics, too. This is beautiful and so roomy, just how I like my wallets and purses. Oh ,I love the top idea!! This is so pretty!! Amazing job!!! I love it as a top! This top is so cute! I love that you kept the long flounce with the shorter top!